It's Day 7 of our 12 Days of Christmas Giveaway! 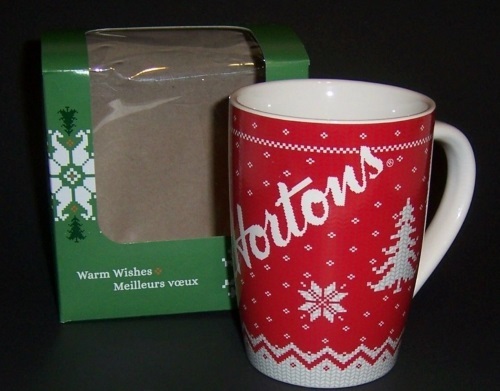 Today's prize is a Tim Hortons Christmas Mug! Please follow the steps in the Rafflecopter form below to enter. Every day's giveaway is only open for the one day so be sure to enter soon! Thank you and good luck! Just milk please and thank you. I would love a mug! I often stop at Tim's for the turkey bacon club combo. I live an hour away from the nearest Tim's but sure look forward to visiting when I am in the area. Thank you so much for the contest. Love the mug. Awesome gifts/prizes. TIM'S ..the Canadian meeting place !! for coffee and conversation. A large 1 cream Please!! Nice cup design this year..Would really like this one to add to all our other Timmies cups.. This Horton's cup would be a great gift to give my hubby. He loves his Timmy's. 3 cream 3 sugar. I like it sweet.